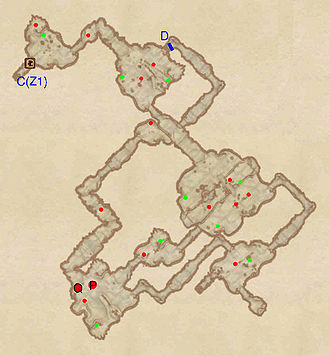 Forsaken Mine is a medium-sized mine south of Leyawiin containing trolls (quest-related). 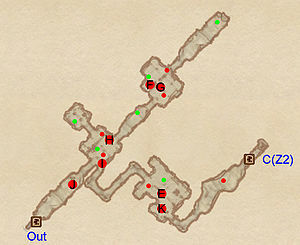 It contains two zones: Forsaken Mine and Forsaken Mine Lost Passages. This mine contains 20 Cairn Bolete plants and 18 Wisp Stalk plants. This cave can be fully explored at any time, without starting the related quest. If you enter it before starting the quest, you will not find the Blackwood Company Member corpse, any of the Fighters Guild member corpses, or the diary. 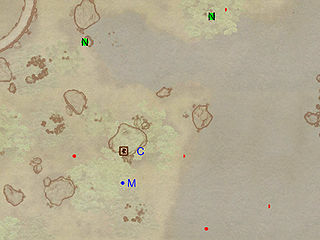 This location's map marker (M on map) is named Forsaken Mine (editor name ForsakenMineMapMarker). The entrance door is N of the marker, 40 feet away. Upon entering, it becomes clear something is very wrong in Forsaken Mine. Before long, you will find the dead body of Fighters Guild member Ariente (J) and the bodies of Ashtus Chenius (I) and Cartrus Gavinius (H) lies around the first corner, with no trolls in sight. Explore the western path for a locked chest and the northern path for more bloodsoaked bodies and loot. Backtrack to the first room and locate the tunnel next to Ashtus Chenius. The next chamber contains the surprising sight of a dead Blackwood Company Member at E and an equally dead Fighters Guild member, Lashana (K). Follow the only available tunnel, where you will finally encounter a savage troll. 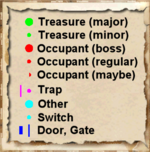 Dispose of it and locate door C, leading to Forsaken Mine Lost Passages. While the first zone was blood-soaked and full of corpses, Lost Passages is full of Savage Trolls, so be prepared. It is also quite complex, but due to the huge amount of valuables it is worth taking the long trek to get everything. Upon arriving through door C, a huge room contains a locked chest and a nuisance animal. The first savage troll awaits in the next tunnel and an additional two in the large room. Locate the two chests and notice the blood-stained stone wall at D, which will lower when you approach it. The best route is to ignore it for now and locate the southeastern tunnel, leading to a large room with a pit in the middle. If you are going directly for your target, Viranus Donton, jump down the pit and follow the green map marker. If you want all valuables, cross the bridge instead and fight the trolls on the other side. Locate the narrow path to the north and proceed forward until you reach another chamber and another troll. Two of the three exits are dead ends, so pick the northern one and head down the slope until you reach your destination, the dead body of Viranus Donton at P and his friend Eduard Hodge (Q). Pick up Donton's bloody journal from his corpse and make your escape through the last tunnel, following the bloodstains until you reach the stone wall at D.